← Off-Peak tickets should be “Super” at Sevenoaks too! Friday 1 February – My destination is Dover Priory today. I commenced my travels on the 10.51 from Bat & Ball to Sevenoaks, arrival was one minute early. The 11.13 to Dover Priory departed five seconds early and arrived one minute early. I returned on the 15.58 service which arrived at Sevenoaks one minute early at 17.17. The 17.22 to Bat & Ball was on time. Surprisingly, a Southeastern employee asked to see my ticket as I crossed from platform one to platform four on the footbridge. If I had missed my connection would they have paid for a taxi home to prevent me from incurring a thirty-minute delay? Thursday 7 February – I am heading for Norwood Junction today. I commenced my journey on the 09.52 from Bat & Ball to Sevenoaks where it arrived one minute early. I travelled to London Bridge on the 09.59 departure which was four minutes late arriving in London. I continued my journey on the 10.51 Thameslink train to Norwood Junction which was on time. This was a twelve-carriage train and to get a comfortable seat I sat in the rear first class area. 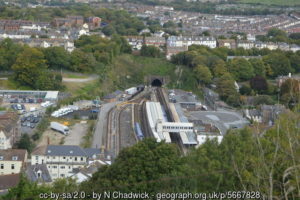 As the train approached Norwood Junction a late announcement was made informing passengers that the platform was too short to accommodate a twelve-coach train, therefore a quick dash through two carriages was required. Wednesday 13 February – My destination is Edinburgh today. I started my journey on the 06.21 from Bat & Ball to Sevenoaks where the train arrived one minute early. Southeastern were having problems, the 06.31 to London Bridge was expected at 06.38. However, it departed at 06.34 and arrived at London Bridge four minutes late. The 06.31 departure from Sevenoaks was my usual commuting train before I retired. Today, about sixteen months after I retired, I recognised one person on the platform at Sevenoaks, and two in the carriage that I usually boarded, who travelled whilst I regularly used this service. To avoid the heat and crowding on the London Underground, and to save £2.90 (or £2.30 if using an Oyster card to cross London), I used Thameslink to travel between London Bridge and St Pancras International for Kings Cross. The £13.00 anytime day single from Bat & Ball to St Pancras International is valid via Sevenoaks and London Bridge. Surprisingly, when I bought this ticket and a single from Kings Cross to Bat & Ball with a Senior Railcard discount, (£10.50), for my return journey, I was directed to the South West Railway’s ticket selling website. The 07.06 from London Bridge departed one minute late but arrived at St Pancras International on time. The 08.00 service from Kings Cross arrived at Edinburgh one minute late. Before leaving Kings Cross, I bought a single ticket for the one and a quarter mile journey from Edinburgh Waverley to Haymarket, fare £1.65. After transferring to Haymarket, I commenced my walk around Edinburgh undertaking some consumer research, a good lunch of haddock and chips was consumed at one venue I visited. I travelled back on the 15.30 service to Kings Cross. Due to a slow train being dispatched from Newcastle in front of the London train it was running fourteen minutes late between Darlington and York, but it was only three minutes late at Kings Cross. I transferred to London Bridge using the Northern Line and arrived in time to travel on the 20.24 service to Sevenoaks. However, this train was cancelled, I boarded the 20.39 service which arrived at Sevenoaks two minutes late. I had missed the connection with the 20.52 to Bat & Ball therefore I was delayed by thirty minutes, another Delay Repay claim submitted. The 21.22 to Bat & Ball was on time. Kings Cross to Edinburgh and return is 786 miles, two advance singles cost me £39.95 for this journey, Bat & Ball to Kings Cross and return is approximately 46 miles, the fare was £23.50. Wednesday 20 February – I am visiting Norwich today, I commenced my journey on the 07.52 from Bat & Ball to Sevenoaks where it arrived on time. The 08.03 to London Bridge was four minutes late. I transferred to Liverpool Street using Thameslink to Farringdon and then the Metropolitan Underground line. This route is quicker than using Thameslink from Bat & Ball to Blackfriars, change on to another train to Farringdon and then the Underground to Liverpool Street; or using only the Underground from Blackfriars to Liverpool Street. It can be quicker to transfer between London Bridge and Liverpool Street using the Northern and Central Underground lines, but this route can be very crowded, hot and has quite a few steps to negotiate. The 09.30 from Liverpool Street was one minute late arriving in Norwich. I returned from Norwich on the 15.00 service and detrained at Stratford, one minute late, and transferred to London Bridge using the Jubilee Underground line. I travelled on the 17.20 to Sevenoaks which arrived five minutes late. The 17.52 to Bat & Ball was on time. I bought two advance first class singles for today’s travel, (from Bat & Ball through to Norwich, and return), costing £35.60 for the approximately 276 miles return journey. Advance first class on Greater Anglia to Norwich does not cost much more than standard class and provides extremely comfortable seats between London and Norwich. Thursday 21 February – My destination is Derby today. The 10.02 departure from St Pancras to Sheffield which I was using to travel to Derby was shown on the information screens as being delayed. There were problems in the Cricklewood area this morning. I asked a lady on the East Midlands Trains information desk if she could provide more information about the delay to my train because I needed to be in Derby before 12.00. In reply she directed me to the 09.31 service, which I boarded about four minutes before scheduled departure time. This train departed two minutes late and run slower than it should have because it was following two slower services. Arrival in Derby was at 11.38, thirty-one minutes late; this was thirteen minutes after the 10.02 departure from St Pancras should have arrived (this original train was eventually fifty-five minutes late at Derby) – good customer service by East Midlands Trains staff transferring me to an earlier train so that I got to my destination when I needed to. I e-mailed East Midlands Trains Customer Services and thanked them for authorising me to travel on a train that my ticket was not valid on so that I arrived at my destination when I needed to. I received a reply thanking me for my e-mail saying that they did receive many positive comments from passengers! The approximately three hundred and forty-six miles return journey from Bat & Ball to Derby cost me £31.70. Thursday 28 February – Today was my monthly reunion in London with my former work colleagues. However, I needed to collect a new battery for one of my cameras from a shop in Aldgate as well. Accordingly, I started my journey on the 09.21 from Bat & Ball to Sevenoaks which arrived on time. 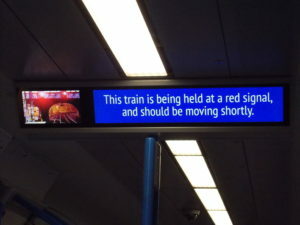 However, whilst waiting for departure at Bat & Ball the following was shown on the on-train information screen; “This train is being held at a red signal, and should be moving shortly.”, there was also a picture showing a red signal. This was displayed all the way to Sevenoaks! The 09.29 from Sevenoaks departed one minute late and was three minutes late arriving at London Bridge. From London Bridge I continued my journey to Cannon Street from where I used the District Line Underground to Aldgate. I used the lift from Cannon Street station concourse to Underground station, I was the only person in the lift and the following announcement was heard over the PA system, “Do not obstruct the doors, this lift is overloaded.”! After collecting my battery, I had plenty of time before I was due to meet my friends. Therefore, I decided to do some consumer research along the District Line. I travelled to East Ham, then Barking and Stepney Green before returning to the Monument station in the City and then heading for the Crosse Keys. My Day Travelcard was good value for money today: Bat & Ball to London and return plus five journeys on the Underground and two bus journeys.